An outward turn of the eye would have helped with 3D to 2D perspective. 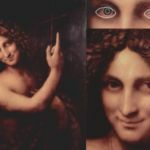 The great Italian Renaissance artist and scientist Leonardo da Vinci may have suffered from an unusual visual tic: an intermittent outward turn of the eye, clinically known as strabismus. According to a new paper in JAMA Ophthalmology, that disorder may have helped this quintessential Renaissance man capture 3D space on a flat 2D canvas so brilliantly. If so, Leonardo would be in very good company. Several other famous artists—including Rembrandt, Durer, Degas, and Picasso—likely also had some form of strabismus, based on analysis of eye alignment in their respective self-portraits. 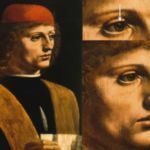 Because such a misalignment tends to suppress the deviating eye, this condition would have enabled Leonardo to shift between monocular vision and normal vision, giving him a distinct artistic advantage. 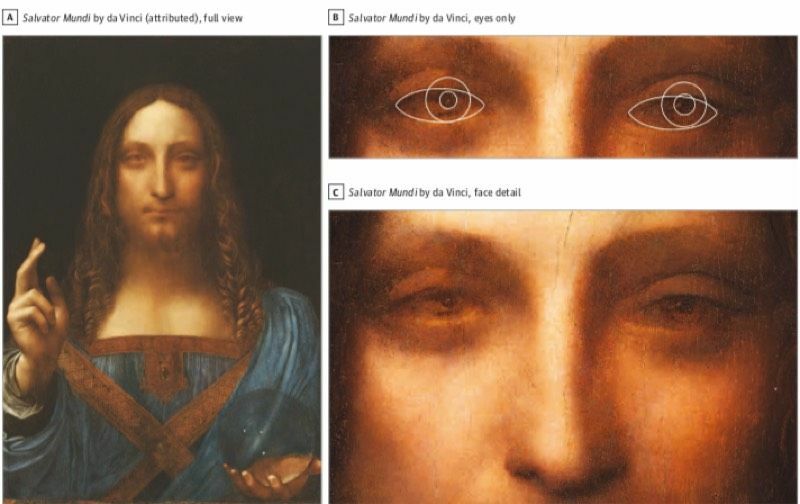 Tyler closely examined six likely portraits and self-portraits (two sculptures, two oil paintings, and two drawings) of Leonardo for evidence of the condition, fitting circles and ellipses around the pupils, irises, and eyelids and measuring their relative positions. Those measurements were consistent with a diagnosis of strabismus. There are remarkably few existing portraits of Leonardo, given his preeminent status in Renaissance Italy, but Tyler argues that any of Leonardo’s portraits likely would have reflected the artist’s own appearance to some extent. “[The soul] guides the painter’s arm and makes him reproduce himself, since it appears to the soul that this is the best way to represent a human being,” Leonardo observed in his Codex Atlanticus. For Tyler, this statement makes it far more likely that he would have used himself as the model in, for example, his famed Vitruvian Man or for the restored Salvator Mundi painting recently confirmed to be Leonardo’s work (it sold last November at Christie’s for a record-breaking priceof $450,312,500). 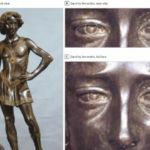 Bronze sculpture of David (1473-5, Bargello) may depict a young Leonardo. Analysis of the oil portrait of ‘Young John the Baptist’ by Leonardo da Vinci (1513-16, Louvre, Paris). Analysis of the terracotta sculpture of a ‘Young Warrior’ by Andrea del Verrocchio (1470, Bargello, Florence). Analysis of the ‘Vitruvian Man’ drawing by Leonardo da Vinci (~1490, Accademia, Venice). 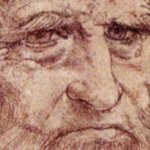 Analysis of the reputed self-portrait drawing when old by Leonardo da Vinci (~1515, Biblioteca Reale, Turin). Analysis of the oil on wood painting ‘Portrait of a Musician’ attributed to Leonardo da Vinci (~1485, Pinacoteca Ambrosiana, Milan). 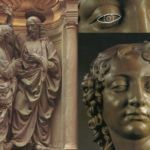 Analysis of the bronze sculpture of ‘Jesus Blessing St Thomas’ by Andrea del Verrocchio (1482, Orsanmichele, Florence). 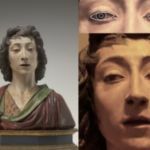 Analysis of the painted wood sculpture of ‘John the Baptist’ by Benedetto da Maiano (~1480, National Gallery, Washington, DC). Admittedly, assuming all these examples really are based on the real Leonardo is a probabilistic inference, so there will naturally be some skepticism. Art scholars disagree about the exact number of Leonardo portraits that still exist. Only one—a red-chalk portrait of Leonardo as an old man—is recognized by the leading authority on the artist, Kenneth Clark, as being definitely of Leonardo. 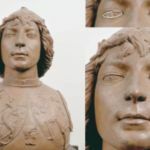 As for the other candidates, the contemporary historian Vasari asserted that Verrocchio’s Davidsculpture was based on a young Leonardo, whom he described as having “outstanding physical beauty.” Since Leonardo was Verrocchio’s apprentice at the time, it would have been perfectly natural for him to serve as a model for the sculpture. 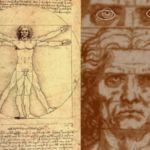 Tyler himself co-authored a 2012 paper that quantitatively examined six of the most likely candidate artworks, concluding the results were consistent with Leonardo being the subject, even though the authors acknowledged that more comparisons were needed to truly reach statistical significance. “All art critics disagree with each other, so I am not expecting them all to agree with me,” says Tyler. But he is reasonably confident in his assumptions and diagnosis of strabismus, even over a span of several centuries. DOI: JAMA Ophthalmology, 2018. 10.1001/jamaophthalmol.2018.3833 (About DOIs). Next story Fluoridation Controversy – fluoride in water is good for kids. So why are these towns banning it?